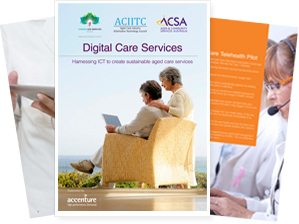 ACIITC joined with global consulting firm Accenture to support the age services industry via a major Information and Communications Technology (ICT) upgrade. Other health professionals such as GP’s and Pharmacists have already benefited from government support to improve their ICT services. The benefits within aged care are considerable, particularly when looking at telehealth that will enable home based consultations and provide enhanced healthcare to Older Australians in regional and rural areas. The message is simple. 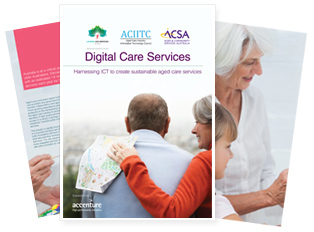 Together we created a vision for ICT across age services. ICT is a key enabler. ICT applications will improve productivity. The industry must harness the power of technology, to make the delivery of age services more affordable and enable Older Australians to live in their homes longer. Age services as an industry must: Think big, start small, scale rapidly but in order to do this the government must develop a framework and work with the peak bodies as they have with Pharmacists and GP’s. The cost of inaction is high.